Greece Blinked – Do They Really Need More Austerity?Greece Blinked – Do They Really Need More Austerity? Greece Blinked – Do They Really Need More Austerity? It looks like Greece blinked and is giving its creditors much of what they’re asking for. In my opinion, it’s just going to create more hardship for the Greek people. In my book, I wrote a lot about the risk of austerity in the United States derailing the recovery in 2010 and 2011. Fiscal deficits were just what the economy needed to offset the demand leakages occurring from deflating real estate prices and the need for more savings amidst a very weak job market. Government spending is income for individuals and businesses and if it is cut then so is the income. It’s pretty simple if we set aside ideology about whether government spending is good or bad. It is what it is. Greece – Where Do They Stand? Everyone says that Greece has to keep cutting and cutting. So where has this gotten the country? 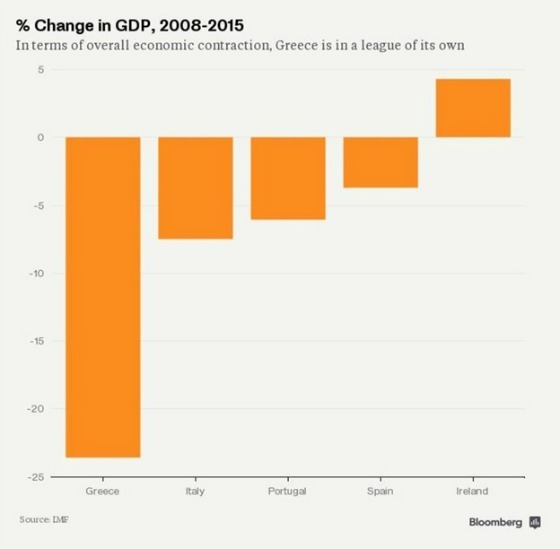 In what I found to be a fascinating Bloomberg.com article someone was finally able to quantify the extent of the pain Greece has had to endure. The fear is that if creditors take a haircut from Greece then Spain and Italy may be next and the dominoes will fall. 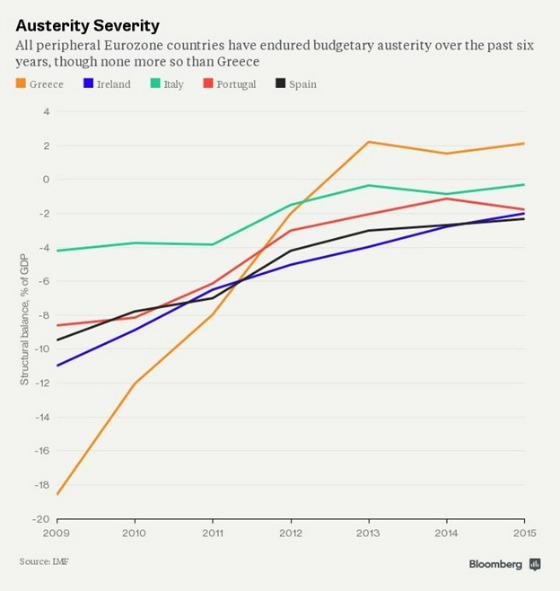 This chart shows that no country can compare to Greece in terms of how much austerity has taken place as measured by the change in the structural deficit. For Greece, it’s been over 18% of GDP. Far more than Spain, Portugal, and Italy. So what has this done to Greece’s GDP? Surprise, surprise..It’s cratered as the following chart shows. Only Ireland has grown, albeit not very impressively, while each of the other countries has shrunk even more than the change in their structural deficits. And with more tightening of the belt through pension reform and greater taxes, I still see more years of pain for Greece. And with an unemployment rate at 25% the last thing Greece needs is austerity. It needs money injected into the economy so jobs can be created. 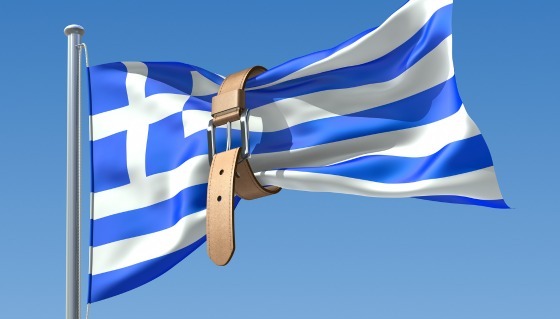 To think creditors will be repaid on time and at par is complete pie in the sky unless the shackles can come off Greece. Greece will need debt relief as well as more capital injected into the country since it ceded its monetary sovereignty to the E.U. and euro. I suggest people read The March of Folly to see how this is yet another example of collective stupidity run amok leading to terrible outcomes. After a 17 hour marathon overnight the Greek government now has an additional $100 B with reforms that are so stiff that many consider them a Greek surrender. If Greece, a country of 11 million people, had been ejected from the Euro it would have been equivalent to Ohio no longer being allowed to use the dollar. Let’s see where this leads. Greece will need debt relief yet how much can they do on their own? What’s their next step? unfortunately you only look at one side of the equation, that of GDP relative to a common currency which Greece chose to adopt along with economic requirements in joining that union that they agreed to meet. Their flagrant failure to remotely uphold these requirements and yet still want to have the purchasing power of the adopted currency has lead to this point. Moreover, I am guessing based on your “RISK” philosophy you do not hold Greek Bonds nor would you lend into the previous environment. I am curious if they meet your risk assessment with the adopted austerity? I appreciate the hardship this is causing in the country and it’s people but it has two solutions, leave the currency and see where that leads or agree to the sanctions to stay in the UNION. Having watched this happen in South Africa and the resulting currency control required and internal dependency on each other, floating their own currency may have been their best solution for future generations. I appreciate your Ohio analysis but you may have been off by a state, if you look at Illinois and what it is facing in future payments, it appears all too similar to Greece. It will be interesting how that ultimately gets resolved and what hardships the pensioners and taxpayers will face. Greece also needs to reduce all the disincentives to work. By simply pumping money into the Greek economy you increase GDP (by definition!) but you just subsidize their socialist economy. You need reforms and money, not just money.